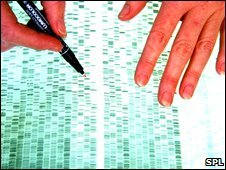 Government plans to limit the time DNA profiles are held on the national database have been criticised for being based on incomplete research. The Home Office has proposed plans for a six- and 12-year time limit. This follows a European Court ruling that it was unlawful to indefinitely retain profiles of innocent people. But the Jill Dando Institute for Crime Science says its research should not have been used as a basis for the proposals because it was unfinished. On Friday Labour MP Diane Abbott and the pressure group Liberty are holding a joint constituency surgery for people who want their DNA profiles to be deleted. It is estimated the database stores details of 850,000 people who were never charged or charged and later cleared. The Home Office believes profiles should be kept for 12 years, for those arrested but not convicted of sexual, terrorism-related or serious violent offences and six years for other crimes. Ministers based their plans on research about the likelihood of re-offending by the Jill Dando Institute of Crime Science. But its director, Gloria Laycock, has revealed that the research was not ready when it was published, along with the plans, in May. She said: "Their policy should be based on proper analysis and evidence and we did our best to try and produce some in a terribly tiny timeframe, using data we were not given direct access to. "That was probably a mistake with hindsight, we should have just said 'you might as well just stick your finger in the air and think of a number'. The government also recommended the DNA profiles of children aged 10 and over, arrested or convicted of a minor offence, should be deleted by their 18th birthday. But Professor Laycock said this went against established criminological findings - which show offending peaks at the age of 17 or 18 and remains high until the mid-20s. She said: "The idea of keeping adults' DNA on a database for longer and getting rid of, I'm going to call them young people rather than children's DNA, for less time makes no sense really on the basis of what we already know about crime." But the key problem is a lack of reliable data on the number and types of crimes that have been directly solved by retaining DNA profiles of innocent people. Meanwhile, the Conservatives described the Home Office's conduct as "appalling" after the researchers revealed there had been pressure to publish data early. Former chief constable Tony Lake, who used to head the national DNA database board says more research is urgently needed. He said: "It is not a straightforward issue because a lot of people who commit the most serious crime and become serial offenders, don't start their criminal careers with serious offences. "This is an immensely complex issue which is why I do think there needs to be a very thorough study on offending patterns." The Home Office has insisted its proposals were "grounded in research", and were a "swift and effective" response to the European Court of Human Rights ruling. Ministers have consulted on the plans and the indications are there will be major revisions before the policy on DNA retention is finalised. It is not the first time ministers have been accused of rushing the release of findings. Last year the then home secretary, Jacqui Smith, apologised for releasing knife crime statistics too early. Her apology came after statistics chief Sir Michael Scholar complained that officials had asked the government not to release "unchecked" and "selective" figures.